GS Custom Settings is a plugin for GetSimple CMS which lets webmasters/ site managers, theme and plugin developers implement and use their own custom settings for output, configuration, and cross-plugin/-theme communication. It allows in one package to achieve the same as Custom fields (but site-wide instead of per page), Slogans, Theme Settings, Links Manager, Custom Title and Translate combined and more. The plugin offers 8 different types of input to choose from, 3 access levels, per-user editing permission, and an easy UI to create, import and export the settings. GS Custom Settings is built on Knockout JS and uses JSON for data storage. You can download this plugin in the Extend repository. To install, simply extract the ZIP file to the plugins directory, and activate it in the Plugins tab. A new tab 'Site' will appear in which you can use the plugin. After you activate the plugin in the 'Plugins' tab, a custom 'Site' tab will show up. NB: You always need to click 'Save updates' to confirm saving any action. To get a setting in a page (in the WYSIWYG editor), simply type (% setting: tab/setting %). To output a setting in PHP, type <?php get_setting('tab','setting') ?>. To return a setting in PHP, type <?php return_setting('tab', 'setting') ?>. Browser compatibility: Compatible and tested with Google Chrome, Mozilla Firefox, Internet Explorer 9+ (in IE8, only Manage mode works). Should be compatible with Safari too. To read the full guide, go to the plugin's page. - Using cyrillic chars in the plugin will cause an error which disables saving updates. - Changing the 'lookup' property of a setting results in non-blocking JS errors. - When restricting permission, Export & Import are also unavailable. - Import &amp; export data directly from the UI as backup/ transfer to other site. 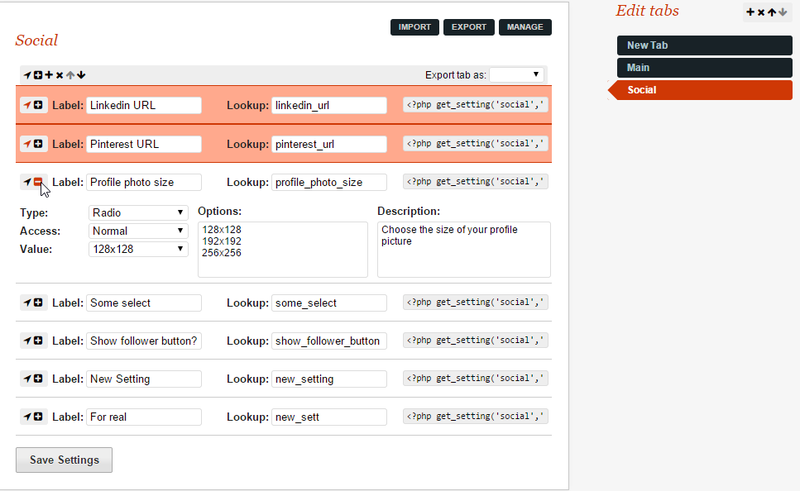 - Export tab directly to JSON for plugin/theme dev with custom settings. - Theme developers can now register their custom settings, i18n-enabled. - Plugin developers can now register their custom settings, i18n-enabled. - Added security token check to AJAX filehandler. - Added languages French, Dutch. - Renamed plugin more appropriately to 'Custom settings' as the focus and intent shifted away from original design. Can you give an example usage, not sure I understand what this is for. Just General settings? What's with the sidemenus and ordering. Sidemenus are called tabs? Are there hooks to register your own settings programmatically? Quote: What's with the sidemenus and ordering. Sidemenus are called tabs? Quote: Are there hooks to register your own settings programmatically? Quote: Can you give an example usage, not sure I understand what this is for. Just General settings? Quote: You could use this plugin for eg, social media links, small texts, picture sizes, basically any tweakable variable based on which you want to modify output. As a last word on use, I should mention that I originally built this to provide extra settings to pass to (I18n) components, which are modifiable by webmasters (as opposed to developers). So a final answer to your question would be: "The plugin provides the ability to register your own custom settings site-wide, like i18n custom fields, but not bound to pages; or like theme plugins, but not bound to themes." In a future release I will also provide an import/ export feature so your settings can be re-used in multiple sites. Thanks for this! I planned on adding a last step feature but didn't in the end, and unfortunately a small piece of unfinished code broke it; FIXED now. It would be nice to be able to interface with this programmatically via a plugin, it would be very easy to write a bridge function to check for and use this instead of writing your own settings manager in my plugin, or using globals etc like, newsmamager does. I could even use this to make a plugin that shims gsconfig with a ui. (2015-02-19, 04:43:21)shawn_a Wrote: Looks promising. What does not work? I tested and it works all fine now. I would do index/token and title as A separate field. (2015-02-19, 06:30:07)shawn_a Wrote: I would do index/token and title as A separate field. Ok, I will look into it. For the delimiter I'll set the possibility to change it in a dirty flag first, and will put it in plugin options later. TYVM for the feedback. Also can you make a read only flag if not already? So if I programaticAlly add a setting it cannot be modified or removed. A readonly or internal flag in he json perhaps? Seems like it would be useful or perhaps add a namespace so if it a namespace is set it belongs to a plugin or I we could just add it via a prefix one he token I guess. I'll have some better ideas if this is even useful after I mess with it. Stupid question why even use a delimited and not just have 2 arguments? I already did take care of that; every duplicate name has a unique ID appended to it automatically. But I am going to implement a separate field for it, no prob. Actually, you can even have duplicate tokens, as long as the tab is different (the function returns only if the tab + token match). Quote: Stupid question why even use a delimited and not just have 2 arguments? That's what I also thought, but I might also keep the option to pass a 'path-like' string because it looks more familiar to non-PHP programmers (me) . So yes, that is a JSON format error. Can you try simply going to /data/other/KO_data/ko_site_settings and delete the data.json file so it can correctly regenerate. Thank you for your perseverance. V0.2 out, check first post for more details. Site & Theme settings are pretty stable now. Plugin hooks might need a tad bit more testing, but should be ok for most of it. Updated the docs, also created a Github repo. Hope the plugin's much more useful now, cheers . Found an important (but not breaking) bug: saving a setting with type 'text' and an empty value will cause the setting to be fully reset. Temporarily counter this by adding a whitespace to the setting. This bug will also cause these settings to appear as empty JSON objects when exporting as theme/plugin settings (unless you add a default value/ a blank space). V0.2 was a complete overhaul of v0.1; V0.2.1 will be bugfix release & browser-testing. I have tested a lot, but can't foresee all possible issues; the plugin is quite complex, and it's my first so bear with me please . Follow-up on the latest issues in the Github issue tracker. Your feedback is welcome. v0.3 out; surprised no one reported that v0.2 had a critical bug causing the plugin not to load properly; anyway here's v0.3! What code to use with the selection operator IF for radio buttons and select. With the checkbox works like this code. Good question Oleg, I might post some new tutorials or info on the plugin page to clarify that. You can see in the documentation section Outputting settings all the return values of different types of settings. It is against those that you should test in if/else clauses. For a setting with options the return value is the zero-based index of the selected option. Why? Because options are translatable, so the text value could differ, while numbers are universal. Your setting sets the profile image size of the user, and he can choose between 3 sizes. With return_setting('tab','setting','value'), you will get 0 (because the first option is selected). With get_setting('tab','setting'), you will get "128x128"
Thanks for the tips, I'm in php round zero, so I always have to ask such questions plugin developers. Yes, that's because the lookup property of a tab is computed from the label and only works with Latin characters (a,b,c,d, etc.) Unfortunately, Russian characters in JS are recognized as 'non-word' characters. I didn't think of this... I'll have to provide a way to provide your own lookup in next version. There's unfortunately no workaround for v0.3 - you have to temporarily use Latin characters for tab names =/. I put together a quick fix, which you can download (simply extract to plugins folder) in attachment.